In this tutorial I will show you how to make a framed earring hanger, to display and tidy all of your earrings. The idea for this tutorial came from reading ‘The Life-Changing Magic of Tidying’ by Marie Kondo. After getting through a couple of chapters, I was energised to start de-cluttering all of my stuff, which as many of you will know is incredibly hard when you’re a crafter! Although I haven’t properly followed Marie Kondo’s instructions as I haven’t done all my tidying in one go (I’d probably have to take a week off work especially just to blitz everything) I do feel better for getting rid of a lot of surplus clutter. Whilst tidying up my jewellery shelf, I came across an old earring holder that had gone a little rusty. I wondered if I could make myself a new one to help with my tidying, and after some internet research, I decided it would be pretty simple. As I mentioned, I am a bit of a hoarder and one thing I have a lot of is photo frames. I’d bought a white one from the clearance section at IKEA just after Christmas, and at the time I couldn’t understand why a lovely white wooden frame was only 50p. It wasn’t until I got home that I realised that it didn’t have any glass and it also didn’t have a back! It was literally just a wooden frame. However, I’m glad I did keep it as I can now show you how to make this framed earring hanger. Measure the inside of the aperture of your frame and cut the aluminium mesh to size with wire cutters or scissors. Be careful as the edges of the mesh are very sharp. I used wire cutters as I thought the metal might blunt the scissors, but it was actually much easier to cut with scissors. 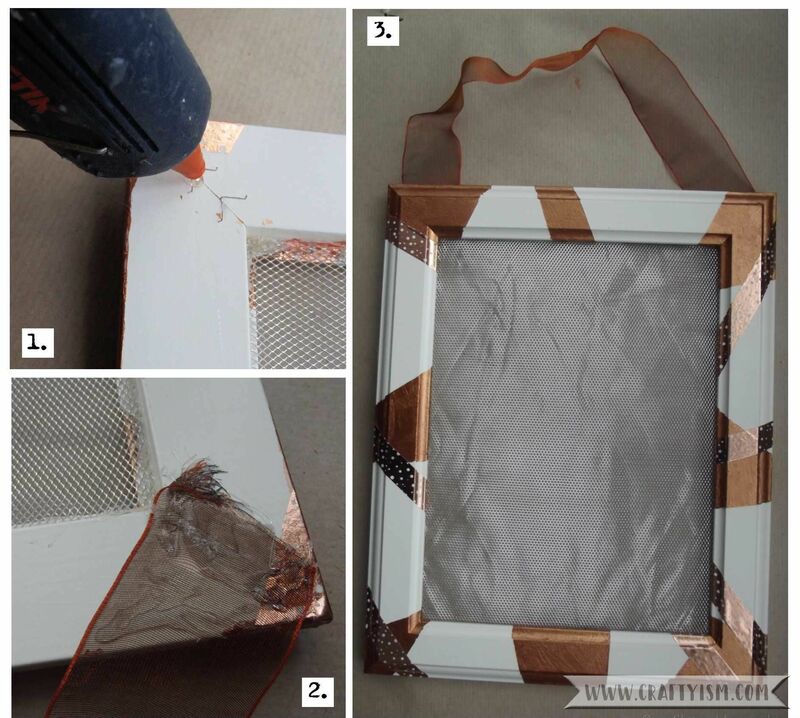 Use the masking tape to mark off random geometric strips around the frame, then paint inside some of the strips. I used a copper coloured acrylic paint. Let it dry and apply a second coat if needed. Once the paint has completely dried, carefully remove the masking tape. 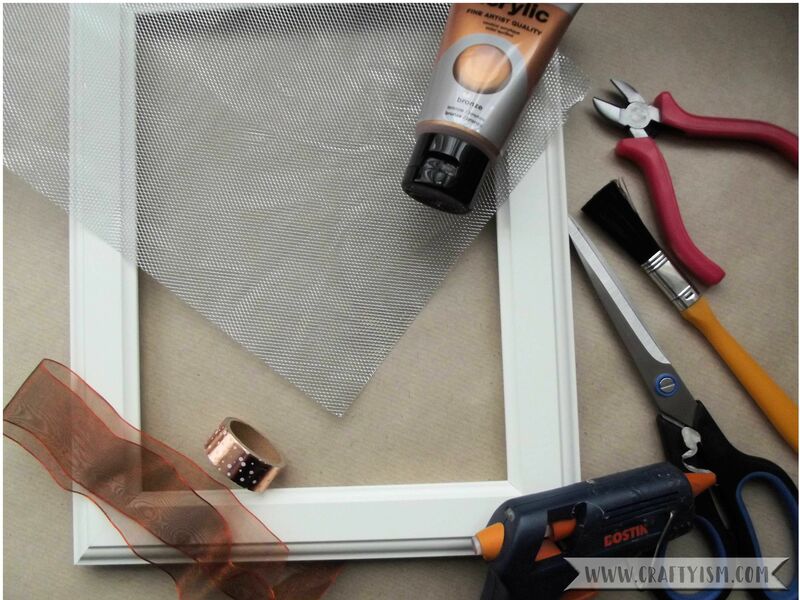 Use the Washi tape to decorate the frame and neaten up the painted edges. I used a polka-dot, copper coloured Washi tape to match my paint, but a contrasting colour or pattern would also look great. Turn the frame over and apply a line of hot glue around the edge of the photo aperture (see the pink line on photo 1). Quickly fit the mesh into the glued space and carefully press down. Then press down the metal tabs on the frame towards the mesh. Finally, apply some hot glue to the top two corners at the back of the frame and stick down the ends of the ribbon to make a hanging loop. To use your framed earring hanger, simply slide the hoop of dangly earrings into one of the mesh sections. For stud earrings, place the stud through the front of the mesh, and secure on the reverse with the earring back. This frame has already helped me, as I hadn’t realised how many pretty earrings I own that I never wear. Now with them all on display and easily accessible, I’ll be able to accessorise my outfits everyday! If you have any crafty DIY’s that will help me with my tidying quest, please let me know.